Jan Olaf Probst has study Naval Architect on the Hamburg University. 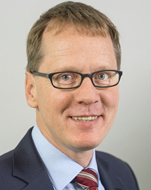 At present he is holding the position as Director Business Development - Executive Vice President at DNV GL. In this function he is responsible for the strategic development of all ship types according to the trend of the market. Activating the research in the respectively direction and guiding the technical sales support world-wide for DNV GL is a further function of the present position. Up to Spring 2012 he has been the Executive Vice President of the Newbuilding Division and responsible for the verification of all vessels at legacy GL in the field of hull structures and ship safety; this includes beside the Head Office departments in Germany, the local plan approval offices situated in China, South Korea and Singapore which had been built up under his supervision. The legacy GL Rule development and programming had been a further major part under his leadership. Jan-Olaf Probst was closely involved with the evolution of Container Ship building in Korea and China from Feeder Container Ship up to the largest Container Ships of today which has been guided by him.